Burlington Township’s South Jersey Girls Soccer League teams honored at council meeting. The Burlington Township Banshees soccer team pose for pictures with coaches Blair Morgen, Calvin O’Neal and members of the Burlington Township Council after being honored for their championship fall season at the Township’s Tuesday, March 12 council meeting. 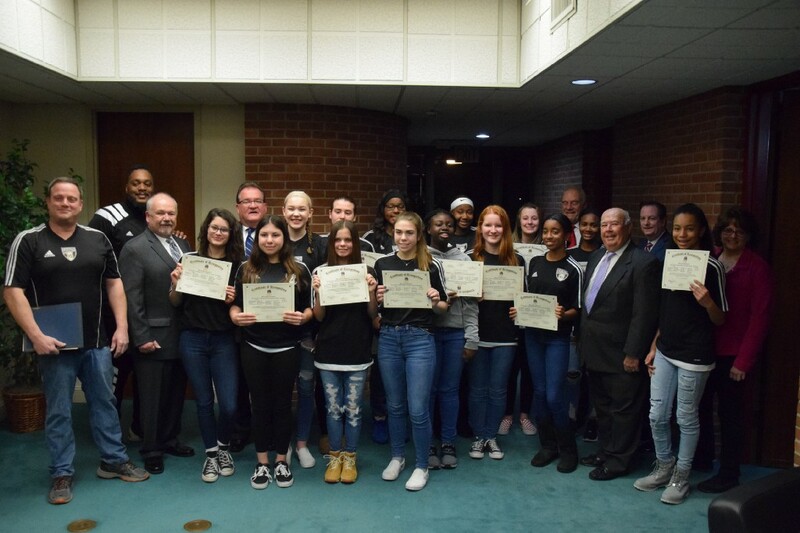 Burlington Township’s U-12 and U-16 South Jersey Girls Soccer League teams, the Heat and the Banshees, respectively, gave the Burlington Township Council a reason to celebrate Women’s History Month at its March 12 meeting where both teams were recognized for their championship fall seasons. The Heat ended their season with a record of eight wins, zero losses and two ties. Six of their wins were shutouts. Carlin introduced the team with a letter from coaches Darci Shinn, Monica Anderson and Liz Davis about their season. “You are a special group because you are all open to growing with each and every practice and game. The girls have faced an uphill battle to get to this point and have shown dedication and hard work can be fruitful,” said Carlin. Assistant coach Anderson also had a chance to address her team before certificates were handed out. “The girls had a great season and they all did a wonderful job. They are always working together as a team and are always supportive. They have very supportive families, parents that show up for everything and come together as a family,” said Anderson. The Banshees ended their season with a record of seven wins, zero losses and one tie. Five of their games ended in shutout victories. Carlin also noted the team’s victories were won despite a majority of the girls playing a year up for their age bracket, facing girls who were older and bigger than they were. Coaches Blair Morgen and Calvin O’Neal attribute their team’s success to how long the girls have been playing together and the leadership of their team captain, Anna Sanverdine. “We’ve had most of these girls for a long time, and we’ve been fortunate that they’ve stuck together as friends and didn’t leave us,” said Morgen. “They’re hard-working girls, their speed helps, and we’re hard on them. We don’t take it easy on them because they’re girls,” said O’Neal. The Banshees’ former coach, Steve Matusiak, stepped down before the season to take a position coaching club soccer at Widener University, leaving the team in the hands of Morgen and O’Neal. The two remaining coaches credit Matusiak with setting up their team for its future successes. “We thank him a lot because he laid the foundation and the framework for the success of this team,” said O’Neal. Councilwoman Joyce Howell left the girls with some words of wisdom before they left the meeting for a team picture with their coaches and the rest of the council members. “There are going to be difficulties in your life, there are going to come stumbling blocks that you can’t get past. You have to remember this night, how you felt as a champion, to get through what you’re going to go through in life,” said Howell.